His painful past and her uncertain future come to a head in this modern-day Cinderella story. Billionaire Xander Callahan certainly seems to have it all: more money than he could spend, a flourishing company, and women lined up to date him. But he has spent years closing himself off from real happiness because of a painful secret in his past. When a mystery woman captures his attention at his masquerade gala, Xander begins to think about opening himself to love again--until she disappears before he gets her name. After Cynder Glass loses her father, she also says goodbye to her dream of running the family event-planning company. Stuck slaving under her ladder-climbing stepmother, Cynder struggles to preserve the legacy her father left behind. When she sneaks into the masquerade gala she helped plan, Cynder doesn’t expect to be swept off her feet by none other than her billionaire client. But if her stepmother finds out that she attended the gala, she will lose her job and her chance to keep the company afloat. When his past and her identity are revealed, is there any chance for a happy ending? Each book is a standalone, happily ever after sweet romance! 5.0 out of 5 starsEmma St. Clair's best book yet. I'm a sucker for a Cinderella story, so I was excited to read this story. The story line was of course, predictable in it's more basic elements, yet it was unpredictable in so many ways. I was kept guessing throughout the book, wondering what direction the story was going to take. The dialogue was believable. Along with the complexity of the characters, this story truly came to life. I enjoyed the connection to another of her books, but it's still completely stand alone if you haven't read the other books in this series. It made for the perfect Christmas break reading. 4.0 out of 5 starsA fresh view on the cinderella story that was enjoyable. I enjoyed the book even though it is a Cinderella formula as it had a fresh twist. I am not a fan of Cinderella and It took me a few cahpters to get into the book. On reading further the characters developed more depth especially Cynder Glass, the secondary characters were interesting . The "prince " a self made billionaire certainly was differnt from the normal hero . I have a feeling there is definitely a continuation book as the Epilogue could have been more conclusive that is why I gave it a 4 instead of a 5. On reading the authors notesat the end of the book I got the impression that sometime in the future there will be a book written about Cynder's best friend Lucy and Xander's assistant Wyatt. The Billionaire's Masquerade Ball features Cynder Glass, her step mother, 2 step sisters and step brother. Add a billionaire rather than a prince. Cynder is still grieving her father's death as she watches her step mother tear apart the event planning agency Cynder built with her father. This is an interesting story where the two main characters refuse to tell each other their true feelings. It is a well written, clean romance that captivated me from the first page. 5.0 out of 5 starsGood Job Emma! You have another hit. For those who haven't read any books by Emma St. Clair, Ms. St. Clair writes 'clean' and inspirational romances. Her books aren't just romances, but a whole lot more. The Billionaire's Masked Ball [The Billionaire Surprise Book 4] is her newest book and one of her best. The book is a modern take on a well know story- Cinderella. The story and character were very believable. The story moved quickly and caught my interest from the first page. The main characters had a few problems but it all works out in the end [and the mean stepmother and her children get what they deserve.] 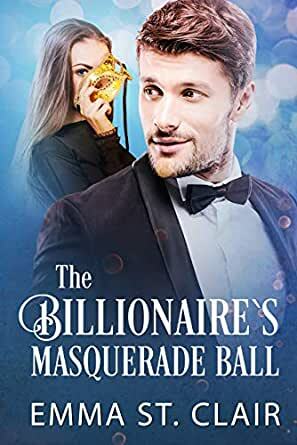 I think that anyone who reads romance will really enjoy The Billionaire's Masked Ball. Good Job Emma!! This was a very good book. Emma is a good author. I have read several of her books and enjoyed every one of them!